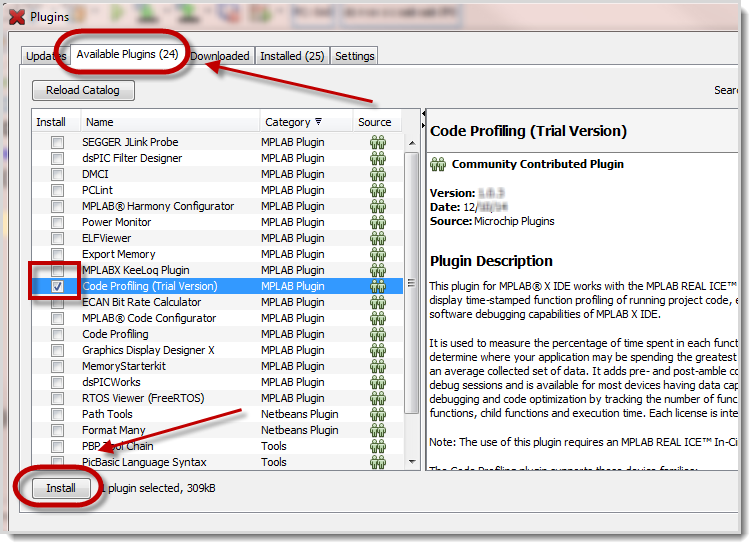 A trial version of the Code Profiling plugin can be installed from within MPLAB®X IDE. The Code Profiling Trial Version is a full featured, 30-day time limited version of the plugin. It is not necessary to install the trial version in order to get the full featured version. The full featured plugin can be downloaded and installed without previously installing a trial version. From the Available Plugins tab select "Code Profiling (Trial Version)", then select "Install"
The Plug-in installer will launch the process in which the user will be asked to accept the license terms for the plugin. The installer will then download the most recent version of the plugin for installation. At the end of the plugin installation process the installer will prompt the user to restart MPLAB X to make code profiling available. The Code Profiling Plugin (SW100100) is available at embeddedcodesource.com. The plugin is delivered as two separately zipped .nbm files. Both of these files must be unzipped and installed for the plugin to operate. Unzip the purchased ZIP file to two .nbm files on your hard drive. Click the Add Plugins… button to add the two .nbm files, one by one. Make sure the Install check boxes for both Code Profiling and Plugin Update Services plugins are checked.